Easy 4th Of July Craft Ideas for kids of all ages. Check out these fun ways to celebrate the 4th of July. Hello Friends! How are your 4th of July plans shaping up? Whether you are taking in a barbecue, heading to the beach or just hanging at home, we have a few fun craft ideas for you to make with your children. Whether you are hosting your own style of summer camp or just looking to get the kids to do something creative, we’ve got lots of inspiration here. It’s hard to believe the Fourth of July is almost here. We always spend our day outdoors with friends. Nighttime is filled with nearby fireworks and music. It’s one of those days that I wish could go one for hours. If you are looking for ideas for a barbecue or potluck, you may want to make this patriotic ice cream, or check out our collection of 4th of July Dessert Ideas. What’s on your schedule that day? 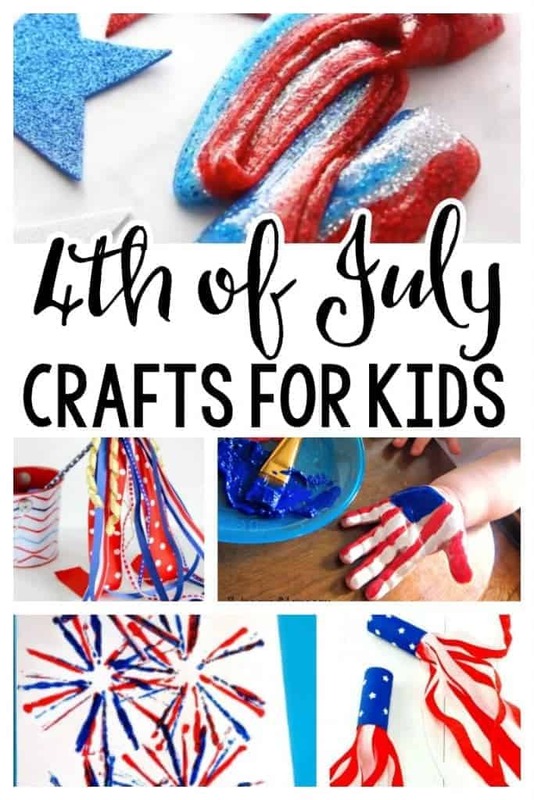 We love sharing crafts for kids of all ages, but today, we gathered up some fun 4th of July crafts for kids that are so cute and festive. These 4th of July Pinwheels from One Creative Mommy are a great craft that your little ones can use to celebrate the holiday. This 4th of July Handprint Flag T-Shirt from The Thrifty Couple is a fun keepsake. Use noodles to make some fun fireworks with this 4th of July Noodle Painting Craft from Mom Dot. Here is a super simple American Flag Popsicle Stick Craft from Moms By Heart. Your kids will love this Firecracker Noisemaker Craft from Mom Endeavors. Be sure and decorate with this 4th of July American Flag Suncatcher from Learning and Exploring Through Play. Next, have fun creating this 4th of July Handprint Craft from B-Inspired Mama and these fun patriotic pails from yours truly. These Patriotic Blowers from Natural Beach Living are fun and festive. You could whip up this fun and easy 4th of July Slime from Little Bins for Little Hands. Here is a super simple 4th of July Dauber Flag Kids Craft from Mom Dot. Your little ones will love playing with these 4th of July Ribbon Wands from She Saved. These Paper Faux Sparklers from It Happens in a Blink are so cute! Make this kid friendly DIY Independence Day Bunting from Itsy Bitsy Fun. Here is a really cute Patriotic Ribbon Crown from Must Have Mom. The Crafting Chicks shared this really cute 4th of July Paper Lanterns Craft. Next, make these adorable Toilet Paper Roll Bald Eagles from Homeschool Preschool. You will have a ton of fun making and using these Patriotic Paint Bombs from Schooling a Monkey. 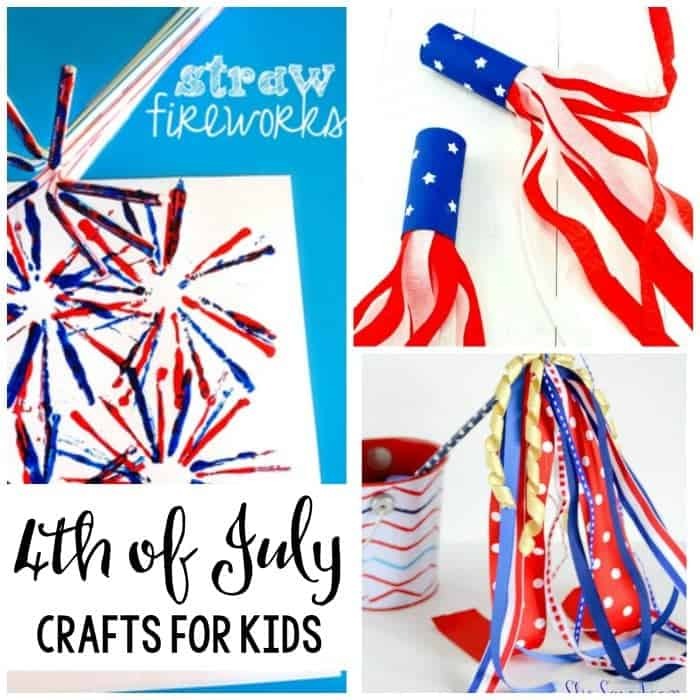 This Firework Straw Craft from Crafty Morning is perfect for your kiddos who love to paint. Make these fun Uncle Sam Masks from Busy Bee Kids Crafts. Finally, here’s a really cute Pom Pom Flag Painting Craft from Crafty Morning. We hope you enjoyed these fun and easy 4th of July craft ideas. Crafting is one of those fun experiences that can be shared by people of all ages. Yes! Definitely seniors too! Some of these are perfect for the elderly.